Campaigners have claimed that ministers are blocking plans to give more help to workers who have lost their pensions. A government actuary was asked to examine sources of funding which could boost the Financial Assistance Scheme. The Pensions Action Group believes he has found enough money to give workers 90% of their lost pension, but says the prime minister will not agree. The government said it was still waiting for the final report and would respond "in due course". The Financial Assistance Scheme (FAS) was introduced to help an estimated 125,000 workers whose firms' pension schemes collapsed before the Pension Protection Fund (PPF) was established in 2005. The government has announced various changes to the way the FAS works since it was first designed, but it remains significantly less generous than the PPF. It pays out 80% of a worker's "core pension", and is not indexed. It does not pay anything until the worker is 65, regardless of the scheme's pension age. In contrast, the PPF pays 90% of a more generous pension entitlement, subject to a cap. It recognises the scheme's pension age and the amount paid has some protection from inflation. Just under 3,500 people are currently receiving a payout from the FAS. Critical reports from the Parliamentary Ombudsman and the Public Affairs Select Committee have called on the government to improve its terms. The European Court of Justice and the High Court have also criticised the FAS. In March, Andrew Young, a directing actuary at the Government Actuary's Department, was asked to investigate the best way to use the assets left in failed company pension schemes with the aim of making the FAS more generous. His final report was promised before the end of the year, and the government agreed to match any extra savings he identified, in addition to the £1.5bn it has already committed. Pensions Action Group campaigner Ros Altmann said she understood Mr Young had now found enough money to boost the FAS to PPF levels. She believes the Secretary of State for Pensions Peter Hain wants to publish his findings this week but that he is being prevented from doing so by the prime minister and the chancellor. 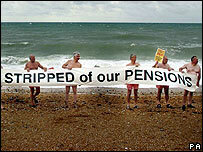 She called on the government to put an end to what she called the UK's "worst pension scandal". "After the instant rescue of Northern Rock savers, at a potential cost of billions of pounds to the taxpayer, the continued delay in settling the pension wind-ups scandal is totally inexcusable," she said. "Responsible government should be about admitting mistakes, putting them right and moving on. "Sadly, it seems Gordon Brown and Alistair Darling are incapable of doing so and this lack of integrity and compassion has led to a bitter row within Cabinet." 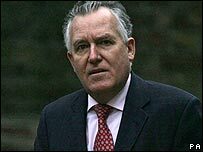 The Department for Work and Pensions (DWP) said ministers were still waiting for a final version of Mr Young's report, which was expected "shortly". "Andrew Young was asked to examine ways of using the residual assets in FAS pensions schemes more effectively for the benefit of those who have lost their pensions," said a DWP spokesman. "We will consider his findings carefully and make an announcement in due course," he added.